We asked the FinTech startups in the alumni of Startupbootcamp FinTech Singapore what burning questions they had for a FinTech lawyer and in this article, lawyer WanHsi Yeong from ArrowGates LLC simplifies and demystifies regulation around FinTech in Singapore, and offers practical advice for existing and aspiring FinTech entrepreneurs. Where is FinTech in Asia headed? To date, most FinTech activity has been concentrated in the payments space, where mobile and e-commerce has led to real demand from consumers and merchants who were poorly or inadequately served by traditional products and providers. Tech In Asia notes that 3 out of the 4 fintech startups featured by TiA dealt with payments. Other innovations that are entering the mainstream include alternative finance platforms, including crowdfunding and Peer-to-Peer (P2P) lending. Future innovations that have been attracting the interest of FinTechs include opportunities enabled by the “internet of things” and Blockchain technologies. In a later article, I will break down major trends affecting the FinTech space (watch out for it later this week!). FinTech is a particularly rich area for innovation, both because and despite of regulation. Regulations are necessary to protect the stability of the financial system and the consumer. FinTech startups which are on top or even ahead of the regulations have a great competitive edge in safeguarding their business model (staying out of trouble) and building the necessary partnerships (e.g. with regulators and other partners). It is precisely because, in complying with regulations (in the form of securing licences, crafting strong T&Cs and data privacy policies, developing the necessary partnerships and cementing them with robust contracts), it creates a barrier to entry to potential entrants which do not have the savvy and stamina to navigate the choppy regulatory waters. It can be challenging for many FinTech startups. Personal Data Protection Act (“PDPA”), Anti-Money Laundering (“AML”) Regulations, Securities and Futures Act (“SFA”)… Sorting through the various regulations can be tedious because there are multiple regulatory bodies and regulations overseeing different parts of the Fintech legal framework, and they are all important and cannot be overlooked). It is also challenging to sort through which of these regulations apply across the board to all FinTech business models, and which of these are particularly important to your specific business model. For example, if you collect, process and store personal customer data, PDPA becomes a prominent regulation for you to watch out for and refine your business model/ T&Cs around (more on this later). In addition to this, regulations are changing very rapidly as regulatory bodies try to keep up with the fast-changing market. This can be frustrating to keep up with it all, but also presents opportunity. The World Bank has ranked Singapore as the easiest place to do business. INSEAD and the World Economic Forum also named Singapore the most “technology-ready” nation. This isn’t a coincidence but is part of a larger strategy by the Singapore government to put itself at the forefront of progress. Singapore plans to become the world’s first Smart Nation by 2030 which targets to offer better living conditions through extensive use of technology. Specifically for FinTech, the Monetary Authority of Singapore (MAS) has launched a “Financial Sector Technology and Innovation” scheme, an initiative that aims to allocate S$225 million over the next five years to help foster the domestic fintech sector. Even if your startup does not have Singapore as a key target market for your client base, it is often useful to benchmark your business model in Singapore because of its strong regulatory environment. While it is appealing to move fast to develop a minimum viable product and validate your FinTech business idea on a very small and closed test, you will eventually need to get yourself aligned with regulations at some point, sooner rather than later, if you see any kind of traction in your business idea. As a lawyer I have delved into the minutiae of the necessary regulations and to simplify the regulatory landscape in Singapore, I would say that there are essentially 3 major pillars you should look to build under your FinTech to make it sustainable and protect your business. First, ensure that you obtain the relevant licence required to run your business. Not all FinTech business models require licences at the moment (that might change), but I will elaborate further as to the licences which FIntech firms should look at/are required to obtain for their business model. Secondly, PDPA caused a stir when it was announced and came into effect not so long ago. One of the main objectives of the PDPA is to position Singapore as a hub for global data management and cloud computing. The PDPA governs the collection, use and disclosure of Personal Data to recognize and balance protecting the right of individuals with the need to collect, use or disclose Personal Data for purposes that a reasonable person would consider appropriate. Therefore, if you collect, process, use and disclose personal customer data, even something as basic as phone numbers and emails, you are required to be PDPA compliant. I will share how you can do this later. Lastly, FinTech companies have to ensure they have the appropriate Anti-Money Laundering (AML) and Countering of Terrorism Financing (CFT) controls in place. In general, financial institutions operating in Singapore are required to put in place robust controls to detect and deter the flow of illicit funds through Singapore’s financial system. Money laundering is the process of converting income that was obtained by criminal or illegitimate means to give the appearance of having come from a legal or legitimate source. Terrorism financing refers to the process of hiding funds to sponsor or facilitate terrorist activity. FinTech companies, especially those dealing with online payments, or internet-based stored value facility holders, have been identified as one of the higher-risk sub-sectors since they may process significant sums of funds across borders. While most, if not all of these transactions may be legitimate, it remains necessary for FinTech companies (in this case internet-based storage value facility holders) to verify and clear all customers of red flags. That said, the AML/CFT regulations, supervisory regime and control measures in these sub-sectors relating to Fintech are nascent and relatively new. Global best practices and standards are still being developed. MAS is considering additional supervisory powers and AML/ CFT requirements to mitigate the risks. There is no generic catch-all “FinTech licence” as such at this stage, as much as many startups would like this to simplify it all! To operate your FinTech you might need one, a few or perhaps no licences to do so. It is crucial to determine which regulatory regime is applicable to your FinTech business model and activities since this will determine which licences you need. Generally, if your business model facilitates outbound payments, you may want to look at the Money Changing and Remittance Business Act. If you provide prepaid wallet or stored value services, you may fall under the Payment Systems (Oversight) Act. If you provide crowdlending services, you may want to refer to the Securities and Futures Act. Depending on your specific business model, these may or may not be applicable. Depending on the business model you have, the main licences that are applicable for FinTech in Singapore are set out below. Please do note that this is a fairly comprehensive summary, but still a summary, so do follow the links in the table to get the full details! Direct Asia Insurance which has the goal of changing the insurance business in Asia by providing customers with the ability to buy insurance products directly, cutting out middlemen and brokers. Licence fees – on a case by case basis, MAS may prescribe different annual fees for different classes of insurance business or for different types of licenced insurers/insurance brokers. Applies to any parent company or major shareholders. PDPA is the acronym for the Personal Data Protection Act that came into effect in 2015 to balance the need to collect basic personal data to render services with the need to protect personal data collected. Personal data under the PDPA is defined as any data which can identify an individual, either on its own or in conjunction with any other data held or likely to be held by any organization. The definition applies to all types of data including health, employment and financial standing data, whether electronic or not, and regardless of the degree of sensitivity. This includes personal data through the use of internet cookies. What kind of FinTech needs to pay extra attention to PDPDA? 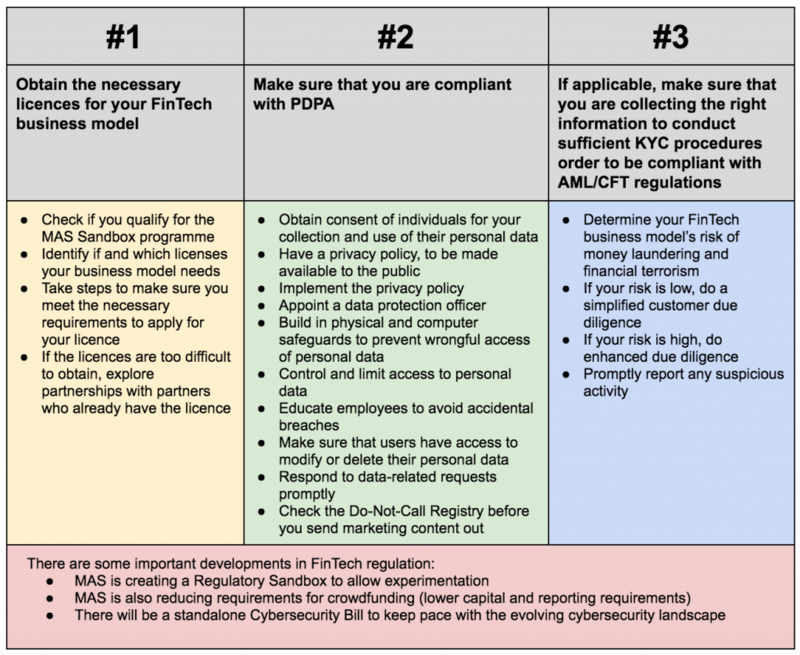 As long as your FinTech business model requires the collection and use of personal data, you are required to comply with the PDPA, for example, crowdfunding and crowdlending platforms, payment and remittance service providers, or if the business model requires a client/customer account to be set up. The first thing to note is that PDPA only applies to the private sector in Singapore, irrespective of size and where the organization is geographically located (applies to organisations not located in Singapore), where the personal data in question is collected in Singapore. It does not apply to Singapore’s public sector. So, what exactly must I do to comply with PDPA? Financial institutions operating in Singapore are required to put in place robust controls to detect and deter the flow of illicit funds through Singapore’s financial system. (iii) Monitor and report any suspicious transaction. Depending on the type of FinTech business model, the specific requirements and standards on the financial institutions are set out in the respective MAS’ Notices on the Prevention of Money Laundering and Countering the Financing of Terrorism (AML/CFT Notices), and MAS Guidance Papers. If they are subject to AML / CFT regulations, then it becomes important for you to undertake efforts to do a minimum due diligence on their clients and stakeholders. Here is a list of steps you need to take to be AML / CFT compliant. Conduct trainings for administration staff who are in a role where they could be handling activities that are potentially be ML/FT related. EDD is required in all circumstances, for PEPs. A standalone Cybersecurity Bill will be tabled in Parliament next year to keep pace with the evolving cybersecurity landscape in Singapore and beyond. The new Bill will ensure that the operators of Singapore‟s critical information infrastructure (“CII”) take proactive steps to secure such CIIs and report incidents of cybersecurity breaches. The bottom line is that compliance continues to evolve as the fintech business environment matures and becomes more complicated. Stay informed and take the necessary steps to build a solid foundation under your business to stay competitive and make sure your business doesn’t suddenly run into major roadblocks because you did not take these steps. Have a question on Fintech that you’d like to ask WanHsi or lawyers like WanHsi? If you need advice on any aspect of FinTech, you might consider having a Quick Consult with me where I can advise you and answer a specific question you may have on FinTech over a 15-minute discussion on the phone for a transparent, flat fee of S$69 here (or click here and click “Request for Quote” if you want to view other lawyers with similar experience in FinTech). Alternatively, you could request a quotation from my firm ArrowGates LLC if you know exactly what you need. This article is written by Yeong WanHsi from ArrowgGates LLC and edited by Gabriel The from Asia Law Network. Tandem and atom banks are considered to be neobanks. As an example of a fintech in the payment space, Fastacash (which does payments) teamed up with DBS. for their DBS PayLah app. Fastacash in itself is not licensed. Compare with MatchMove Pay which is also in the mobile payment space. But MatchMove Pay applied and was granted a remittance licence. It would depend on the business model of the Fintech as well. I can’t seem to pinpoint where the “51% equity controlled by a Singaporean citizen” is from in the Act…? you stated – CEO or director must be Singaporean – this is mandatory ? if none of the founders are Singaporean, one Singaporean must be hired as CEO or director ? – Each of said employees to have a representative’s licence for activity — does it mean other than the company need a CMS license, said employees need a CMS license individually ? 1. With regards to Directors, the company’s board of directors should comprise a minimum of 2 members, at least one of whom is a Singapore Resident. Further, the CEO has to be Singapore Resident as well. A Singapore Resident refers to a Singapore Citizen or a Singaporean Permanent Resident. 2. Yes, you will require at least 2 full time employees in respect of each regulated activity for which the company is seeking to be licensed to conduct. It is one the requirements of the Monetary Authority of Singapore (“MAS”) for the grant of a Capital Market License (“CMS”). 3. Yes, individuals will be required to acquire a CMS Representative’s License in order to act as a representative of the company (the CMS License holder) in conducting the regulated activities.